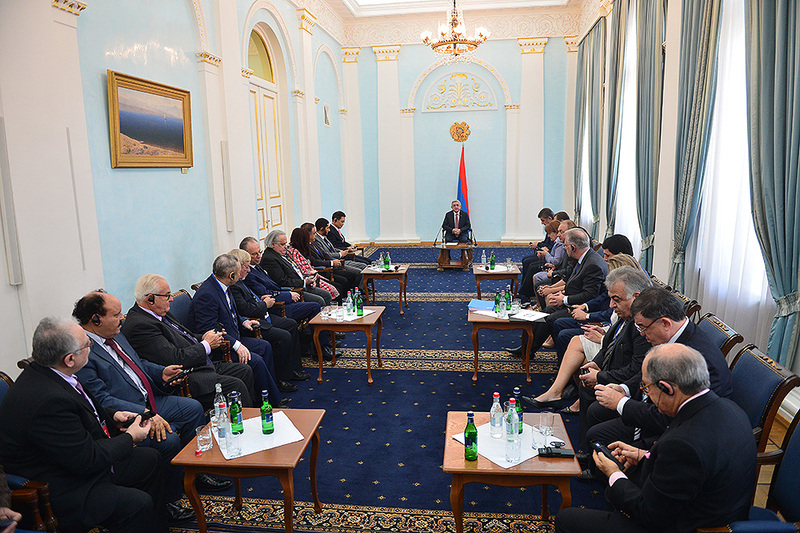 President Serzh Sargsyan received today participants of the Eurasian Partnership First International Conference. Welcoming them to Armenia, the President stressed the importance of the fact that the start of this helpful initiative carried out jointly by the World Armenian Congress and Union of Armenians of Russia is given at an impressive level since, according to President Sargsyan, each of the participants has the opportunity to bring his or her significant contribution to the success of the Conference and ensure its continuous nature. Serzh Sargsyan expressed hope that the Eurasian Partnership International Conference can become an important platform for the representatives of the state, business and public circles of the member states promoting the creation of practical mechanisms aimed at the opening of the potential for cooperation among these countries and opportunities for the expansion of the multilateral economic cooperation. President Sargsyan noted that we are always glad to welcome our partners to Armenia and that our country is open for the discussions on cooperation programs. Serzh Sargsyan briefly spoke with the participants of the meeting about Armenia’s economic priorities and responded to their questions.